The Sherco TVS Rally Factory Team has announced the names of the three riders who will compete in the 2019 Merzouga Rally. 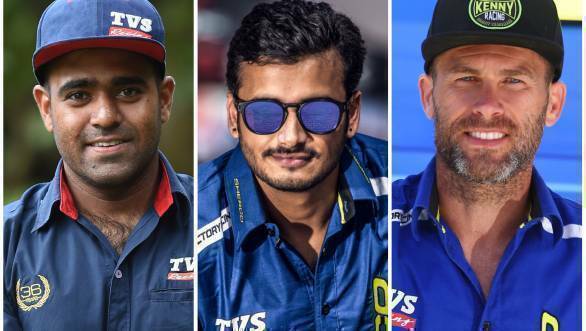 The squad includes Indian riders Aravind K. P. and Abdul Wahid Tanveer, along with French rider Michael Metge. While Aravind and Michael will compete in the 450cc category, Tanveer will take part in the Enduro category. The 2019 Merzouga Rally is set to take place between March 31st and April 5th, and it marks the Sherco TVS Rally Factory Team's third outing at the event in Morocco. The team is hoping that the rally kicks off the run up to their 2020 Dakar campaign on a positive note. The rally will be held over five days, and the competitors will have to deal with the dunes of the Merzouga, soaring temperatures, and tricky navigation. Metge is charged with leading the Sherco squad, bringing his years of rally experience to the event. Meanwhile, Aravind, who finished the Dakar rally for the first time in 2019, has 17 national rally championship titles to his name. Tanveer, won the Enduro category of the PanAfrica Rally in 2018, and finished second in the Enduro category of Rally of Morocco last year, and also won the Dakar series India Baja 2018. Speaking ahead of the event. B. Selvaraj, team manager, TVS Racing, said, "The Sherco TVS Rally Factory Team had a good racing season last year and our Indian riders proved their mettle with some outstanding performances in the international rally circuit. We are all set to step in to a new race season, and hope to deliver some strong performances in the coming year. Merzouga Rally sets the stage for the future races as it offers an ideal platform to evaluate the physical and technical strengths of the team. The three-member team will look to dominate the rally and ensure strong results."